Tommy Dennis is a mauler who dominates his opponents in the Ivy League. He is one of my diamonds in the rough for the 2019 NFL Draft. • I am from East Setauket, Long Island, New York and the best thing about my city is the Seport Deli, they have the best chicken cutlet sandwiches. 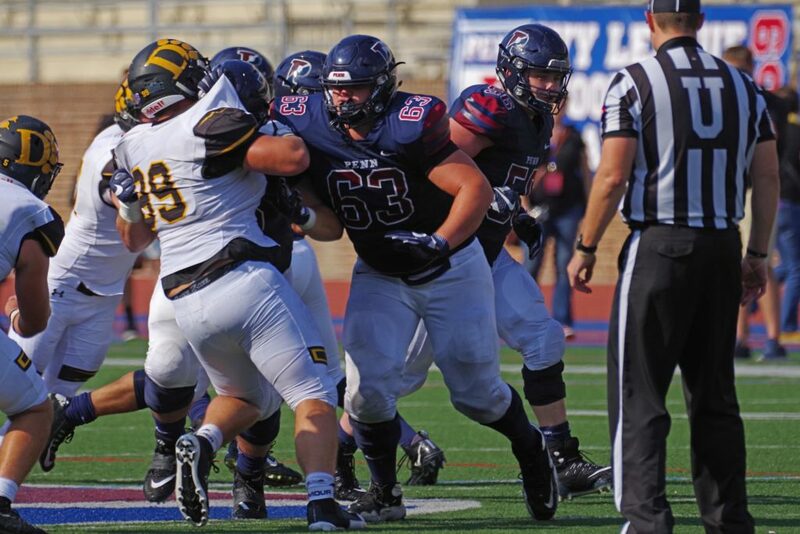 • First – Practice, the only way to get better is take as may reps as you can and as an OL, building chemistry as a unit is extremely important. Second, Strength and Conditioning is important because It helps avoid injury as well as makes sure you are performing at the highest speed and power. Finally, Film study is very important but in order to be ready for games you need to train and practice hard. When studying film, you can learn defensive tendencies such as giveaways for DL stunts as well as defensive shifts. • I worry about letting others down, I have people who rely on me and I strive everyday to make them proud. • I let up two sacks my sophomore year, so I trained my pass set all offseason in order to never let my QB get hit again, and I didn’t let up any sacks the next two years. • My teammates would say that I am accountable, always holding myself and my teammates to the highest standards. • Richard Jarvis DE from Brown. • Room, I don’t want to start the day in a messy environment. • I would save one family memory because if I saw a family member in need I would help them no matter what. • I would be James Bond because he is a savage. • Growing up in a single parent household, my mom made so many sacrifices so I always pushed myself to the limit to make sure that I made her proud and all he works wasn’t for nothing. • Missing two free throws to lose a basketball game by one point sophomore year of high school. • Game-winning play with 1 minute left versus Harvard sophomore year, we went on to win the championship. • Here comes the boom – Nelly. • My Dad, he passed away when I was four so I would love for him to see me grown up. Who is the most overrated player in the NFL? • Respected, anyone can be liked but it takes a hard worker to be respected. • Michael Vick, he served his time and changed his life around but still could never fix his reputation, plus, he was one of the most exciting players to watch of all time. • My Mom, she has always supported me no matter what and has helped me get to where I am today.